Last week, as part of our parent speaker series, my school hosted Dr. McCurry. A clinical child psychologist, his talk was titled: The Anxiety Dance: A Parent’s Guide. He spoke mainly about how we can either react or respond to behavior regardless of whether you were a parent or teacher. His talk provided us with several examples and strategies of how to help children who have anxiety whether or not it is clinically diagnosable. A week before that, I attended part of Evergreen School’s speaker series’ presentation by Allison Master: Mindsets Revisited: Exploring the power of growth mindset and word choice in motivating children. Every once in a while a book comes along that can be transformative. In terms of teaching, Carol Dweck’s book, Mindset was one of those for me. Master who has co-authored a few articles with Dweck, began with a quick introduction defining the two kinds of mindsets that have been researched, fixed and growth. 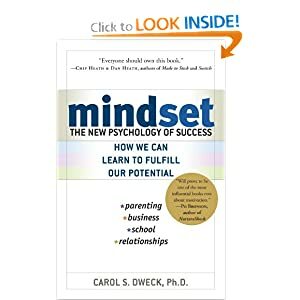 The word “mindsets” is becoming overused and can describe a lot of things not related to Dweck’s theory, so if you’re unfamiliar with her work, search using the terms “fixed,” “growth,” and “mindset” and that should get you going in the right direction. One of the most important things I’ve learned abo about helping students manage anxiety or fostering growth mindsets is the language we use with them. What we say as parents and educators can be so influential. The feedback we give can impact a child for years to come. There’s a huge difference between saying to a child, “You’re a good drawer!” and “You put a lot of effort into that drawing.” The first places value on the ability. The latter places the value on the effort or process. Which one do you think privileges actual learning? The language we choose to use with our students influence mindsets profoundly. A healthy dose of anxiety is normal, but it too places value on the process rather than the event. You acknowledge the event and feelings with a timestamp, like, “I can right now that you’re frustrated…” Then give the child agency to make a decision to move away from a fixed idea of their frustration to one that will pass. A great book our faculty is reading is called, Opening Minds: Using Language to Change Minds by Peter Johnston. It cites Dweck’s work and goes on to show how powerful the language we use can affect the way children perceive themselves. He uses the terms “fixed” and “dynamic” to describe the way we think about ourselves. Basically, learning is something that we can change and knowing that our brains are plastic and adaptable is important. When a child is having an, “I’m stupid,” moment, it’s imperative to help the child recognize that it’s just a moment, not a fixed idea. A child with a growth mindset is going to have less anxiety, learn throughout life, and develop resilience. As adults, it’s natural to want to rescue a child, but as an adult you have to know the difference between pushing a child out of the way of a speeding car and doing their homework for them. Furthermore, both Master and Johnston show the evidence of how language influences social and moral agency. If we put a fixed label on ourselves, it becomes very different to find the value in others and develop the empathy needed to work with those with differing views. I haven’t read McCurry’s book yet, but I highly recommend the other two. They might just change a life. That was pretty much how the NAIS conference ended. It was the last slide for Cathy Davidson’s closing keynote. I couldn’t agree more with that statement. For some teachers, it may seem a scary thought, but for most in attendance, it was validation that the we live in a very different world than we did even five years ago, and we need to adapt and prepare our kids for an unknown future. Her most recent book is called, Now You See It: How Technology and Brain Science Will Transform Schools and Business for the 21st Century. I recommend you visit her website and check out some notes from her talk here. I am a big fan of Davidson’s work, and Davidson’s ideas resonate with me a lot, but I feel she can sometimes back herself into a corner with her beliefs, and rather than present her ideas with a more balanced approach, her arguments often come across polemical. Move from critical thinking to creative contribution. Both are important. I agree with Davidson that students need to build, make, do, invent, and so on, but they must be able to discern, analyze and evaluate while doing so. I think I know what she’s trying to say in that statement, but it still evoked a reaction from me. Prior to mentioning this, Davidson talked about a website that appeared to be a great kid friendly resource on farm animals. It turns out that this website was an ad. We need to instill a healthy dose of skepticism in our students, prepare them to think critically. 1) Develop a sense of wonder, play, and inquiry. 2) Learn how to find and use the resources needed to grapple with the questions they encounter. 3) To empathize, listen, network, and collaborate with humility and be able to discern between what is useful or purposeful, and what is superfluous or meaningless. I know, there are a lot of things going on in the last one, but it was hard to come up with just three. I also had another response: Though I’m not religious, the following three things come from a prayer I learned as a child. Courage – to change the things we can. Wisdom – to know the difference. I think we can prepare students for the first two of those, but the last one is something we have to learn on your own. I know I’m still working on it. One of the things I enjoyed both this year in Philly and at home last year in Seattle was that the featured speakers were accompanied by “graphic recording artists” who captured visually, in real time, what was being said. Here’s a pdf of Cathy Davidson’s closing keynote. Data: Is it Reliable? And What do We do with it? It’s been almost a couple of months since my last post, and I find myself thinking of data again. Earlier this month, the Gates Foundation released its cumulative findings on its 3-year Measures of Effective Teaching (MET) research project. They recommend a balanced approach which included observations and student perception surveys in addition to achievement test scores. If you look at the data in the report, much can be gleaned, yet it’s easy to see that effective teaching is a very complex thing to measure. Also in the local news this week, teachers from a two different Seattle Public Schools, for various reasons, have stated they are going to boycott the district standardized test known as the Measures of Academic Progress (MAP). There are many reasons standardized tests cause anxiety among students, teachers, parents, and school leaders. Often they are used as sorting mechanisms (admissions into schools, teaching effectiveness, and putting students on a certain track are just a few examples). Yet, if one approaches the data from these assessments with more purpose (to set new goals, to inform ones teaching, provide meaningful feedback, or guide learning), these measures can be useful. Data today is abundant, but is it the right data? How data is collected, analyzed, and interpreted; how reliable it is; and what we do with it can make all the difference. Though the Gates Foundation and those Seattle Public School teachers are doing it differently, I’m glad there are many out there asking these questions. Is Quantifying Teacher Performance Akin to Flipping A Coin? Last week, on the way home from school, I tuned into a story on the radio titled: “Seattle Releases First Teacher Ratings Based on Student Performance.” Data is great, but if you paid attention to the elections a few weeks ago, there were two kinds of math going on. Nate Silver’s Five Thirty Eight blog predicted 50/50 states. Karl Rove’s analysis of the data had him flummoxed. The difference was that Rove was emotionally attached, was eager to win, and for some reason his analysis of the same polls was way off. Alternatively, Silver simply plugged numbers into complex algorithms. Ewings paper, “Mathematical Intimidation: Driven by Data,” Looks at the potential pitfall of trying to create Value Added Measures to teacher evaluation. Like the election examples earlier, we often attach a lot of emotion to the data creating a lot of noise. This noise had the potential to lead to bias. When a teacher says, “But I’ve done this for 20 years. I know this works,” it is evident that experience plays an important role. But is there bias involved. During those 20 years, did that teacher ever once control the experiment by not utilizing a particular skill? If so was the result the same, better, worse. Without trying to control for various things, how does one really know if what you do works. Is it just a feeling or is it based on empirical data. Finally, there are so many things that make a good teacher: relationships with students, high expectations, integrity, care, leadership, collaboration, etc. Yet all of these traits can’t be tested for. Standardized test scores are a reality and here to stay. As long as graduate schools use test scores as a tool to help with admissions, and undergraduate schools do the same, high schools and middle schools won’t have much of a choice. Elementary schools just follow. There’s a dark side to this. Children as early as Pre-K are getting tutored in test preparation. Like the qualities of teachers, students have many amazing strengths and skills. However just because they struggle with test taking, potential doors my be closed without even giving the child a chance to show the brilliance that lies within. And what about those 21st Century Skills – Critical Thinking, Communication, Collaboration, Creativity, etc. Will teachers drop integrating teaching these skills in order to meet the demands of the test scores? I hope not. The last two days have been great days for me in terms of having collegial conversations. They were two very different events, but both professionally stimulating. The final keynote speaker at the PNAIS fall conference (almost a month ago) was Rob Evans. He spoke of the many challenges teachers face in having collegial conversations with each other. Some challenges are obvious, like time. But others exist because of the nature and culture of teaching. Teachers spend more time talking to students than they do talking to other teachers. And as Roland Barth observed, when teachers do get together for things like faculty meetings, what they talk about has very little to do with learning or instruction. In Evans’ article, Getting to No, Evans highlights the difficulty of giving teachers feedback. With the rise in trying to quantify teacher quality and performance, and linking it to job retention, compensation, and other factors, it’s natural for teachers to become defensive when receiving feedback rather than seeing it as an opportunity for growth. It’s also natural for some teachers to play it safe and not try anything innovative or take risks in order to better their craft. I’m really excited to be on a committee at my school trying to address these challenges. Yesterday, I had 4 teachers in my room observing a lesson, and I in return was able to observe lessons of two of my colleagues. As this is the first time, we’re not at the stage of exchanging feedback yet, though we all agreed that we would feel totally comfortable soliciting that feedback from our peers. We also felt that as long as we weren’t being evaluated, we could trust each other to honestly ask or answer any questions we had about our teaching. This process wasn’t just a learning opportunity for the teacher being observed, but as an observer, one can learn so much from watching their colleagues teach. This doesn’t replace teacher evaluations, but contributes to a culture of learning, growth, and collaboration. It also adds to the professionalization of teaching. I just returned from EdCamp Seattle today, and it was quite invigorating as an educator. EdCamps are ‘unconferences’ that came about in 2010 as a way for teachers to come together, exchange ideas, and have those collegial conversations. Like the exchanges in Paris Cafés in the 1920s, but with educators. Ok, it’s nowhere near as romantic as poets, artists, and philosophy. This is the second one that I’ve had the privilege of helping organize. Unlike traditional conferences, participants put up the topics, issues, and ideas that they’d like to discuss. Some are more instructional and informational, others are more collaborative and hands on. While participants mingled over coffee as they arrived, a blank grid was filled to offer over a dozen workshops and conversations. Topics included, design thinking, ipads in the classroom, teacher evaluations, strengthening literature and math, common core transition, and many others. There were over 70 participants today. Unlike other conferences, there is no registration fee. EdCamps are free and voluntary. It’s always invigorating to see so many educators continually pursuing growth in their profession. 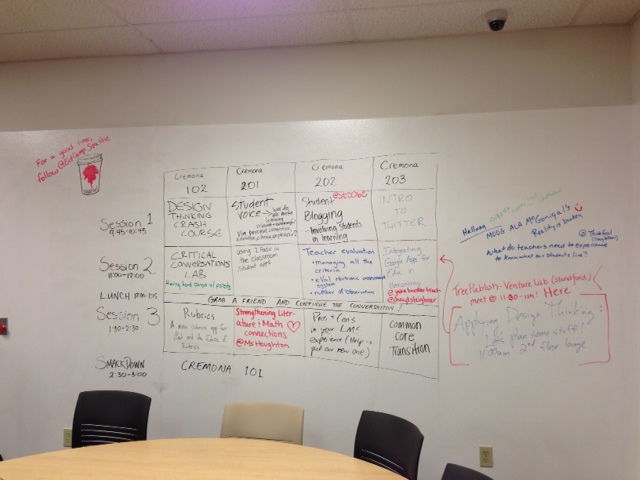 In 2010, a few teachers had an idea and, in that year, 8 edcamps in various US cities. This year, there have already been over 100 edcamps including ones in Hong Kong, Dubai, Belgium, and Christchurch, NZ! The London Olympic games are coming to a close, and I’ve noticed a few themes/issues throughout the games that seem to spill into the realm of education: 1) How do we measure success? 2) In 20 years, other sites may push twitter or Facebook aside, but I’m pretty confident social media is here to stay. How do we promote digital citizenry and prepare kids to use these tools productively and? 3) Privilege and equity – does every country have a fair shot at a sailing or equestrian medal? Does every child have access to a good education? 4) Standards: what are the standards for commentary on the Olympics? I know very little about gymnastics, but I don’t need someone to point out that a fall off an apparatus is not a good thing. Did the opening ceremony need a play-by-play? Can you imagine giving students the answers rather than providing opportunities to grapple with, discover, and construct their own knowledge? There are many more themes that have emerged from these games, but the first one I mentioned resonates with me the most. How do we measure our own success and the success of our students? After Michael Phelp’s fourth place finish at his first event, the USA Today had a story titled: “Sluggish Michael Phelps is not swimmer we expected in London.” Since his first event, Phelps has become the most decorated Olympian in history, but I guess if you look just at the one fourth place finish, sluggish it must have been. Why is it that some athletes cry for joy after winning a silver and other athletes are visibly disappointment, often with tears in their eyes for winning a silver medal. The most emailed article in the New York Times over the past three days has been one titled: Raising Successful Children. 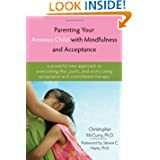 It’s a parenting article about the importance of not over-parenting and allowing children to make mistakes and build resiliency on their way to success and confidence. I’m not a parent, but I completely agree with the statement, “HANGING back and allowing children to make mistakes is one of the greatest challenges of parenting.” It’s a challenge of teaching as well. Not all failures are equal. They need to be ones that lead to growth. So what kind of mistakes should parents and teachers let kids make? Perhaps being called ‘sluggish’ and then coming back to win 4 gold and 2 silver medals can qualify as a good measure of success. I just came back from a great three day summer planning inservice with my colleagues where we spent a lot of time looking at and practicing how we assess and give feedback to our students and to each other. I wish us all a successful school year that can be measured by the risks we take ourselves in that gray area just beyond the comfortable and by the resilience we develop in our students. Should Educators in the Lower Grades Consider Eliminating Homework? The research on homework is indeed ambiguous, so it’s nice to have a group that has the time to look at the research more closely. Over the past three years I have looked at my current practices (the policies are outside of my control) and considered eliminating homework (short of reading for pleasure), but the reception of this has been mixed. I’m glad that there is more support for what I’ve been advocating. The suggestions they offer to teachers and parents to make homework more engaging and meaningful are also good. For many adults, finding work/life balance can be tricky. Especially if one is truly engaged and finds meaning in their work. An article published in today’s NYTimes about a course at Google to help their employees achieve that balance comes as no surprise. It would be nice to ensure that our students begin to develop a healthy balance?